Friends of sun and sea. 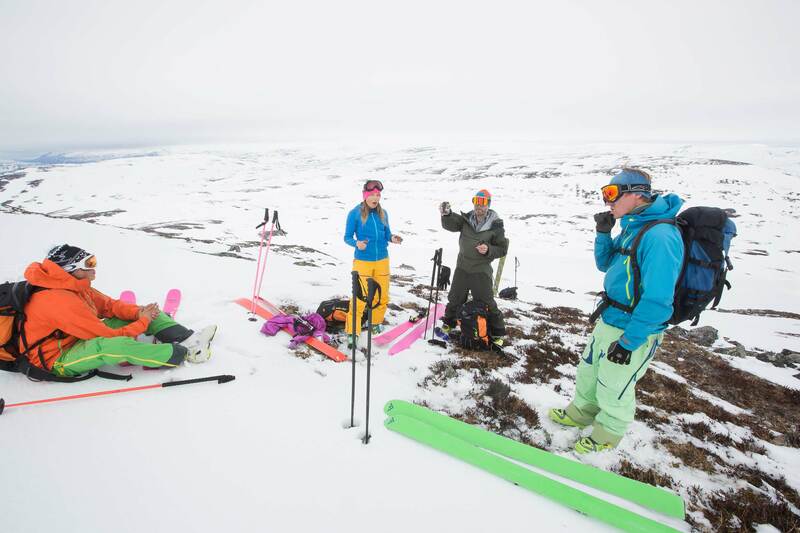 Nordic meeting focused on skiing and fishing. 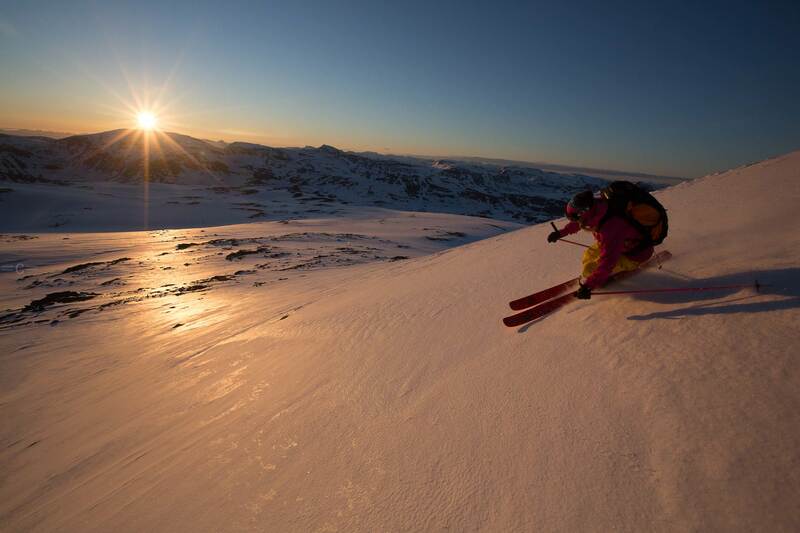 At the end of May 2015, the crow fatale Minna Riihimaki and the photographer Cédric Bernardini went to reap some Scandinavian descents before putting the planks away. A ski moon spoiled by the arrival of a band of fishermen as merciless with the shoals of cod in the Arctic Ocean as those of Chamonix with the après-ski. Smugglers of cat-fish, assassination attempt by avalanche, customs officer’s subordination, a weird epic where the skiing is only a sham for freely enjoying the beauty of the high latitudes. 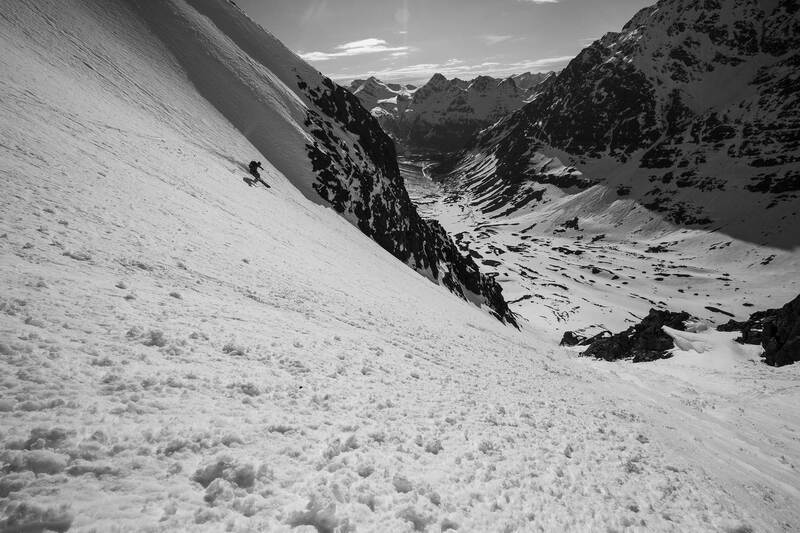 The end of season was so inauspicious for big ski projects in the Alps, that I began dreaming about Scandinavian regions where the winter likes to take its time before bowing out. I really wanted to revisit the Lyngen and more particularly the region of Tamok at its extreme south. An area which is quite unknown and little visited. The weather conditions there had been as capricious as they had been at home, but the snow was abundant and the season continued. 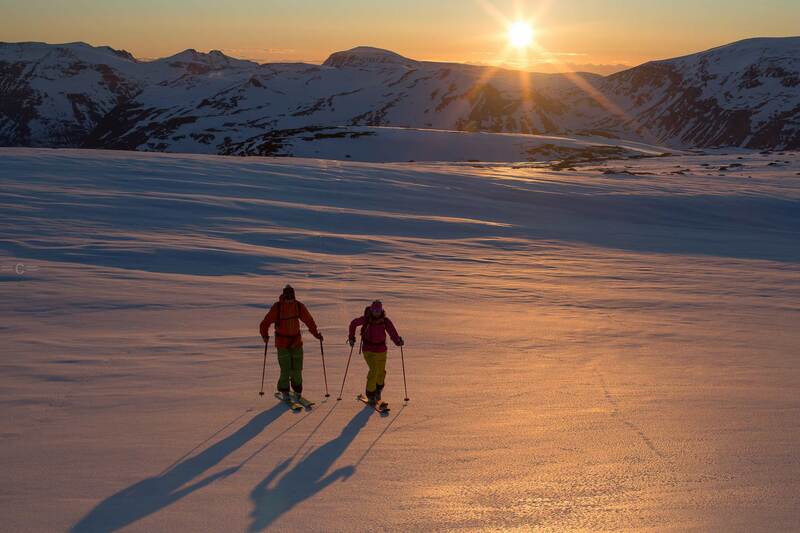 My friend and photographer Cedric Bernardini was happy to accompany me to ski under the midnight sun. This would be his first trip to Norway, the fifth for me. Cedric was quite sceptical about our late departure, but I promised him that there would be enough to do if ever the skiing was not at its best. Thor Falkander welcomed us at Tromso airport. The last 30 minutes of the flight had given us an unobstructed view of the Lyngen Alps and the snow cover was very promising. When I left the plane I was as excited as a child and really happy to, once again, meet up with my very energetic friend Thor. We climbed in to his car and headed towards Tamok. Thor’s parents own a two hundred year old property. It nestles between a river full of salmon and a forest harbouring numerous wild animals. There is neither electricity nor running water, but an old wood burning stove and a real Finish sauna! Drinking water flows abundantly in the river and Thor masters, with perfection, the different parts of the house managing fires in all the rooms. 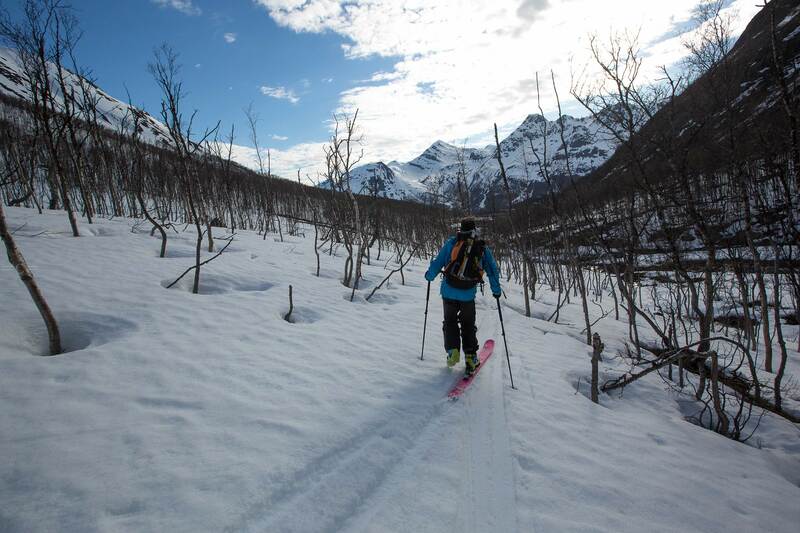 After three days of skiing in Tamok with mixed and snowy weather, we decided to leave and explore round about. 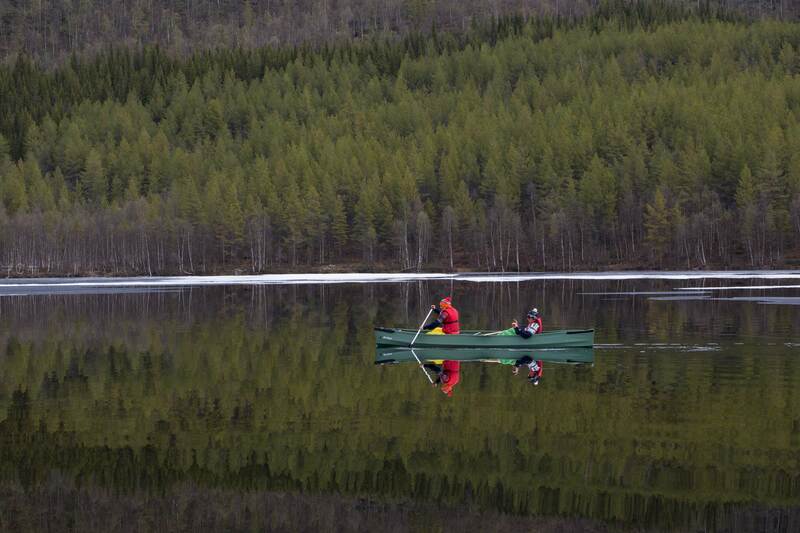 Lapland consists of three countries, Norway, Sweden and Finland. The three borders meet at a point an hour’s drive from the most mountainous region of Lyngen. It is even possible to reach the three-border signpost on foot and have two feet and a hand in three different countries! I had conjured up this trip with my compatriot Skipe several years back. 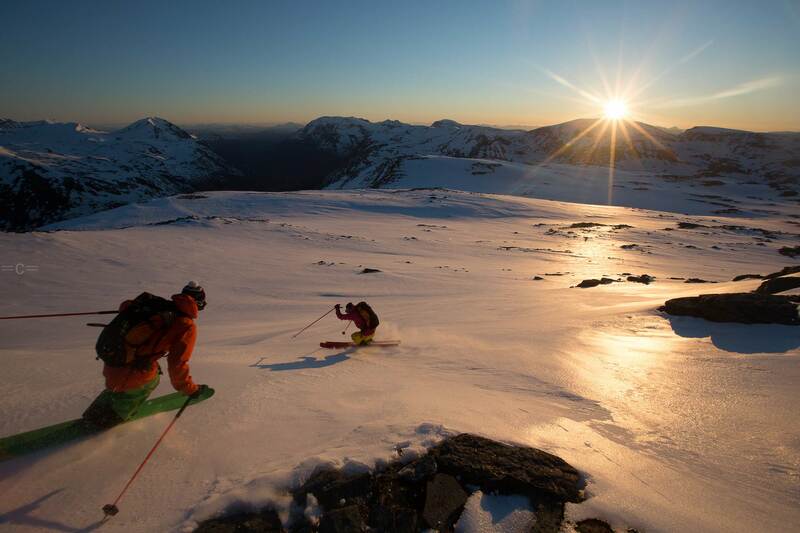 Skipe is a legendary Finnish skier and pioneer of free-ride in the north of Europe. We’ve known each other for 20 years. 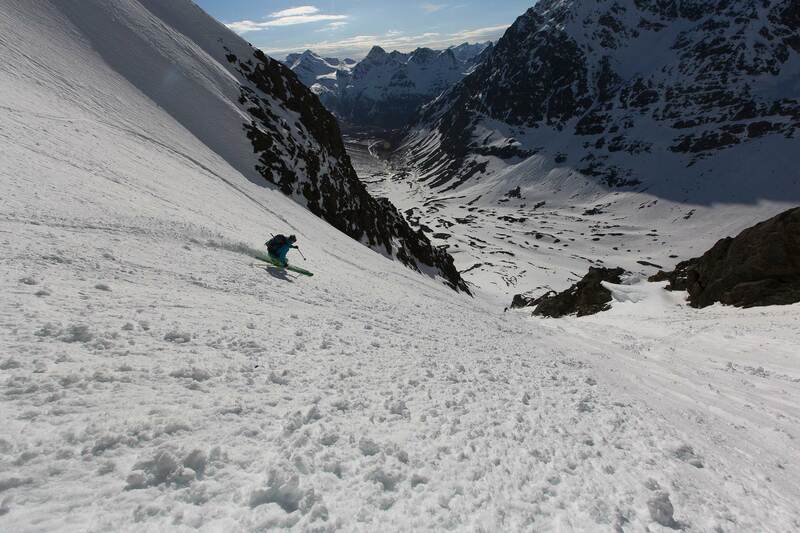 He spends all his winters in Chamonix and traditionally finishes his season in Lyngen to ski and fish. This cheerful character handles a fishing rod with as much precision as he handles his skis. The meeting was fixed in Finnish Lapland, an hour and a half’s drive from Tamok. Skipe joined us by car with another Finn, Mikko Juntunen. Once again I was really excited because, since my departure from Finland, 21 years ago, I had never skied in the north of my country. Hardly 300 metres after crossing the border between Norway and Finland we were subjected to a police check. A Monday morning at 8:30, a breath test for the driver Thor. It is true that there is no hour for alcohol abuse at these latitudes….Noting our ski equipment, the policemen started to brag about his exploits on an old snow-scooter. Skiing is definitely a great conciliator. Our aim was to go and explore the gullies of the Terbis. The north face of the tunturi (Lapp mountain) is strewn with gullies of 400 metres aligned side by side. Unfortunately the re-freeze during the night had not been enough to support the heavily laden skidoos. In the back of my head, I jealously thought of the policeman’s story… A plan B was necessary. Happily, there are tunturi every where in Lapland. We had set our sights on Saana-tunturi, the famous mountain in the traditional Kalevala stories, a book of epic and imaginary stories. I was delighted to climb the summits of my childhood memories. From the top of its 1200m, Saana-tunturi gave us two beautiful descents. The first on the north face across a system of gullies where, our snow-scooter maestro, Ville Eskonen’s unstinting advice, was a great help when finding the exit. Then we went back up on the sunny side to finish with a more springlike descent. Before crossing the border in the opposite direction, we profited from better prices to stock up at the local Finnish supermarket, then we hit the road again for Thor’s ‘cabin’. The sauna heated while we benefited from the calm of an evening sipping well earned beers. To conclude this special Finnish day, I cooked a cult dish from my country, a reindeer stew accompanied by bilberries and fresh mashed potatoes. A delicacy which was finished to the point of licking the plates…. The following day, we woke to bright sun and blue skies. 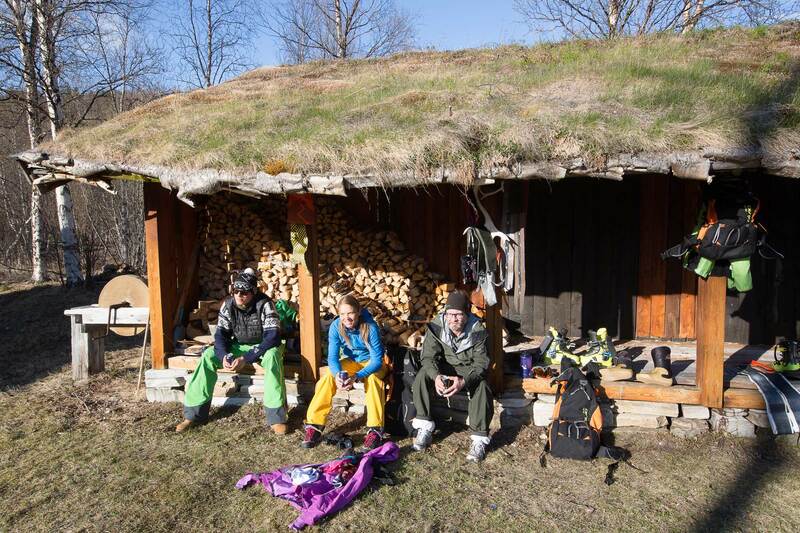 When we reached Lakselvbukt, in the south of Lyngen, it was already warm. We had this time the north face of Guhkesgaisa as our objective, a beautiful gully which is always in the shade. Gradually, as we approached, the summit quietly sunning itself and we were able to see an overhanging cornice above our heads. It was impossible to know whether it was going to resist the heat or fall erasing everything which it would find in its path. We decided not to go and see…. After several beautiful turns on the sunny side of the valley, we had a lunch break on a flat area, sheltered from avalanches of spring snow. The Jet-boils heated the food and the coffee. The days are endless at this period in the north. The sun doesn’t set. No need to watch for nightfall or carry a head-torch. Carefree, we all sank in to a refreshing sleep. Cedric climbed at his rhythm a little below us and Skipe was around 200m further down. We had virtually reached the summit when two snowballs the size of footballs detached from the rocks and started to roll down gathering speed and diameter in the blink of an eye. In the distance which separated us from Cedric, the 2 snowballs transformed in to an avalanche of wet snow. Skipe had just stopped behind the last rock promontory. He had had the time to put down his pack and skis in the snow and take out his water bottle when he heard us shout. After a quick glance upwards, he sheltered and clung on to the rock. The world around him became white with a brain splitting roar. 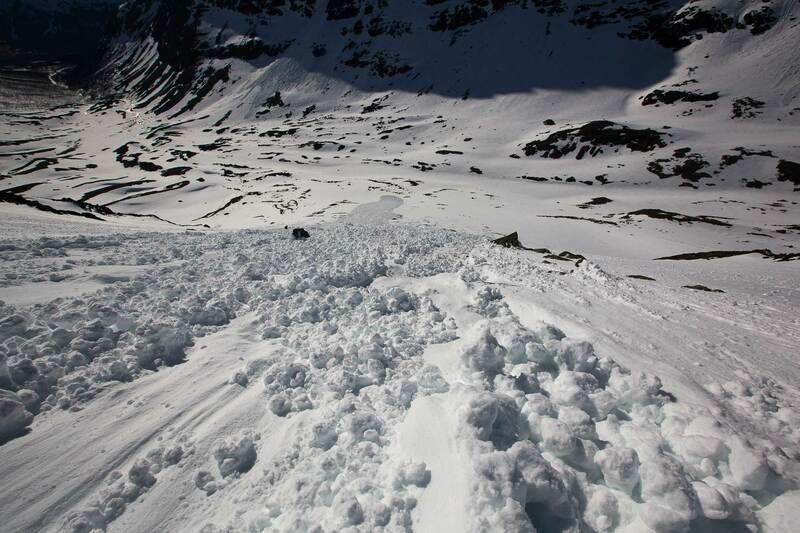 His skis, poles, pack and water bottle disappeared with the avalanche. From my view point, 200m higher, I was convinced that he was attached to the back-pack that I had seen surfing the surface at a breath-taking speed. I bawled at the others that Skipe had been taken as I put on my skis like a robot ready to go down the slope to rescue him. At the same time knowing that it was unthinkable to find a living person in an avalanche of wet snow where a cubic metre of wet snow weighs several tons…. Rather, it would have produced 70kg of minced meat. I had made four big sticky turns by slaloming in the metre deep channel left by the avalanche and I stopped incredulously in front of the rock promontory, Skip was there, standing up, staring straight in to my eyes. I had never been so pleased to see him and that is exactly what I told him. 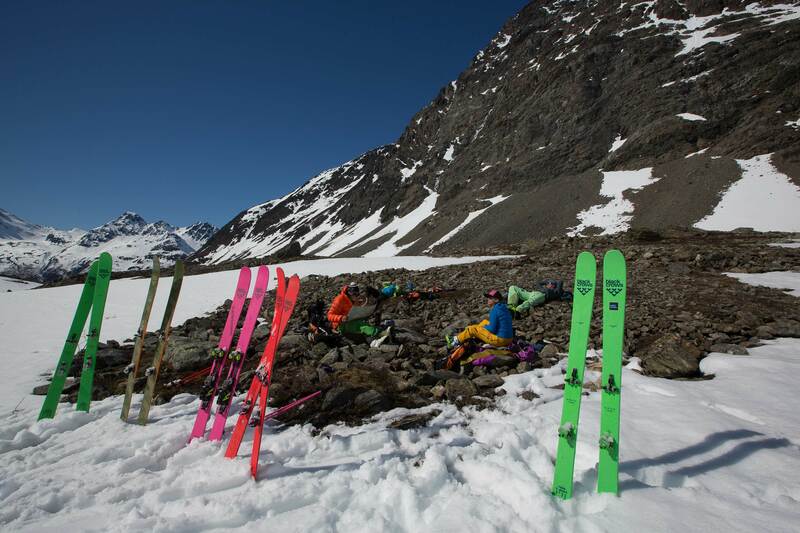 We were able to recuperate one ski quite close by, the poles mid-way and the back pack at the bottom of the valley. 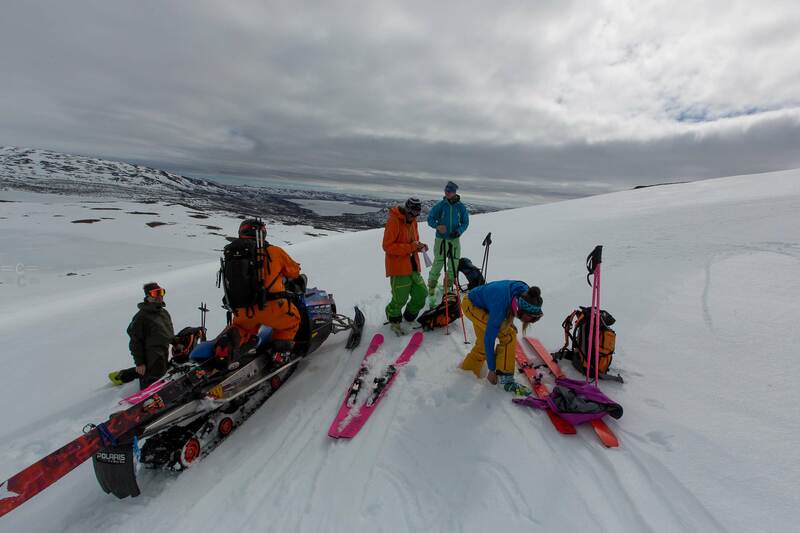 With only one ski lost, we considered ourselves to be very lucky… Skipe went down « mono-ski » while we cogitated on the hows and whys of what we had just experienced. The next day, the fatigue made itself felt and we decided to go to Lyngseidet and the seaside, to change to the fishing stage. 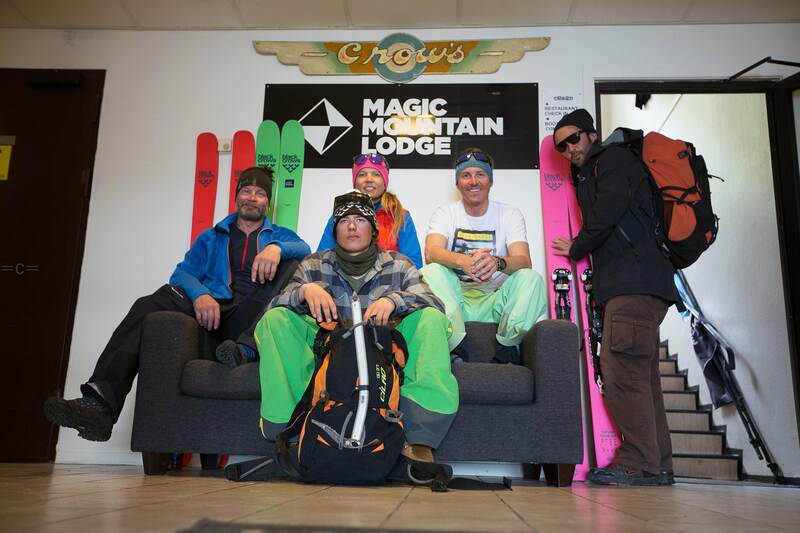 The owners of the Magic Mountain Lodge had kindly left us the keys, they themselves having gone on a well earned, post hectic season, holiday. Thanks to Skipe, Stein-Erik Sörheim-Brygge lent us a small boat with fishing equipment so that we could go and test our luck with Poseidon. We hadn’t shopped for dinner, the challenge was launched (happily, there were still a few beers from the Finnish supermarket…) And we weren’t wrong! We each caught large cod, then as we approached the shore, Skipe and Thor caught several pounds of cat-fish . This is an extremely ugly and aggressive fish with sharp teeth, but unfortunately for them, they have a tender and tasty flesh. 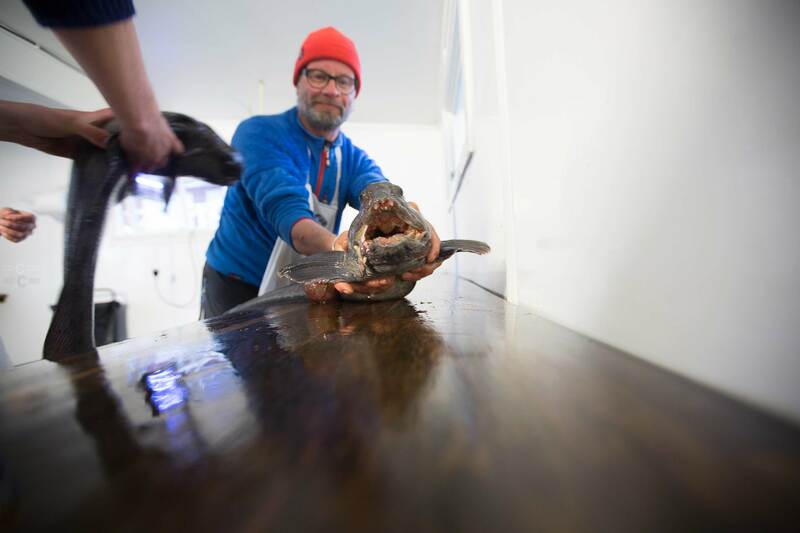 We later heard that three days after our departure from Lyngseidet, a local had caught a shark on his fishing rod… Skipe and Mikko went back to Finland, for them the ski season had reached the end. 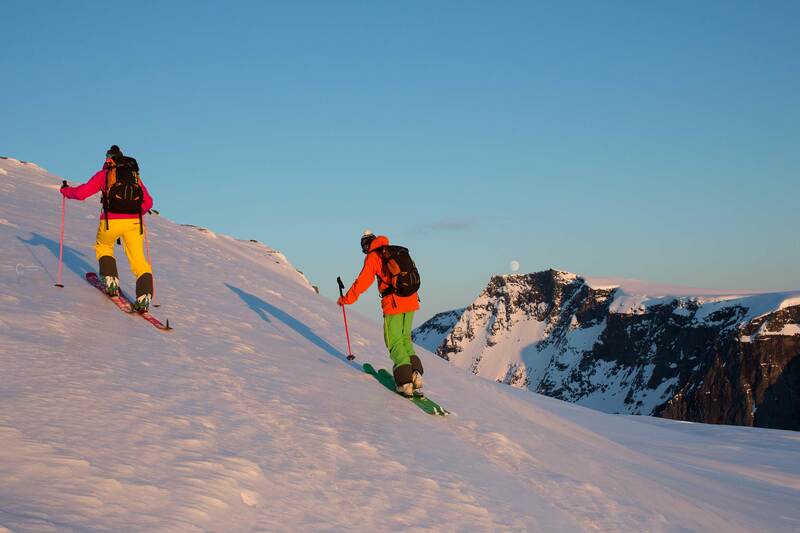 For us, we had located some mountains to the south of Tamok which even Thor had never skied. After a stop at a service station to buy a map of the area, I started to feel the excitement of exploring. We spent several hours studying the map, the access, the exposure, the ascent/descent and the steepness of the slopes. Without knowledge of the area and a detailed guide, the preparation work took on another dimension. The sun shone without interruption and the temperature climbed dangerously. The safest time would be to leave at night. 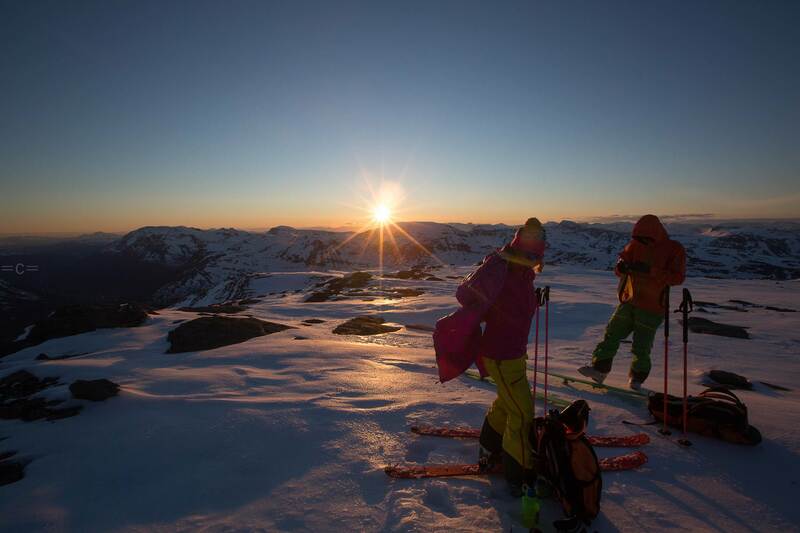 That suited me as I had always dreamed of the midnight sun on a mountain summit! The sight from the summit of Mattagaisi at 1:30 in the morning with a ball of orange fire to one side and the moon to the other left us speechless. The changing colours of the sky which painted the mountain as they pleased was a magical gift. An experience that I would have happily repeated the following night. But the month of June arrived and with it the summer; it was time for us to come home. I had hardly sat down in the plane , when I was already hoping that I could return….. Certainly next year. Special thanks to Bente and Peter for their hospitality at Tamok and Magic Mountain Lodge and Stein-Erik Sörheim-Brygge at Lyngseidet.